When the Moon Hits Your Eye, Like A Big Pizza Pie…That’s PIZZA Y’ALL! In my very best singing voice…ahem….“When the moon hits your eye like a big pizza pie, that’s amore’….” Hmm. Not so great. I better stick to cooking. “Although the word “pizza” was first documented in 997 AD in Gaeta and successively in different parts of Central and South Italy, the history of the dish itself is not very clear or well documented. The precursor of pizza was probably the focaccia, a flat bread known to the Romans as “panis focacius”, to which toppings were then added,” so says the Wiki. Well I’ll be derned y’all! All I know is Pizza is for sure one of my super favorite meals, evah evah! It is so simple yet lends itself to low fat, gluten free, low carb and “heart attack in a box” options! For the sake of the good health of this here readership, let’s stick to the healthy versions, shall we? Last night I plopped myself in the kitchen at the Hassienda, fully prepared to swap the usual Thursday night “Clean out the Fridge for Leftovers Dinner” fare to last night. I had a very long day and leftovers sounded simply ideal. …especially the leftover ½ bottle of 2010 Meritage . But then it dawned on me, I had thawed some homemade pizza dough! Whoo hoo! Pizza on a Wednesday! We…are in business y’all! I decided to make two pizzas, one with turkey pepperoni and veggies, the other, my favorite, Margherita. Because you KNOW you can top these with ANYTHING your little heart’s desire, I’m going to share with you my recipe for awesome pizza crust and a to die for tomato sauce. The great thing with these is BOTH can be frozen for later use I LIKE EASY y’all. You can go from there! I’m also going to offer some low carb, vegetarian and gluten free options for your crust. I’m giving y’all healthy, but how much you eat is TOTALLY on you! 3 1/2 to 4 cups bread flour, plus more for rolling. Bread flour will give you a much crisper crust. If you can’t find bread flour, you can substitute it with all-purpose flour which will give you a chewier crust. Combine the bread flour, sugar, yeast and kosher salt in the bowl of a stand mixer. Add the water and 2 tablespoons of the oil and beat until the dough forms into a ball. If the dough is sticky, add additional flour, 1 tablespoon at a time, until the dough comes together in a solid ball. If the dough is too dry, add additional water, 1 tablespoon at a time. Scrape the dough onto a lightly floured surface and gently knead into a smooth, firm ball. Grease a large bowl with the remaining 2 teaspoons olive oil, add the dough, cover the bowl with plastic wrap and put it in a warm area to let it double in size, about 1 hour. Turn the dough out onto a lightly floured surface and divide it into 2 equal pieces. Cover each with a clean kitchen towel or plastic wrap and let them rest for 10 minutes. This dough can easily be frozen for later use. In a medium saucepan over low heat, warm the olive oil. Add the garlic and cook, stirring, for about a minute. If you’re using dried oregano, add that along with the garlic. If you’re using fresh, add it to the sauce at the end of the cooking time. Increase the heat to medium. Add the tomatoes, sugar, red pepper flakes, salt, and black pepper. Leave over medium heat, stirring occasionally, until boiling. Reduce heat to low for a nice simmer. Simmer uncovered for 90 minutes. Stir in fresh oregano, if using. If you prefer a nice smooth sauce, you can use an immersion blender, regular blender or food processor to gain the desired consistency. This is also a great recipe for canning or freezing. Bored? If you are quite the pizza connoisseur and are bored with pizza, try some new toppings to add flavor to your life! Add some pineapple or dried figs and bleu cheese; pears and balsamic vinaigrette with arugula; even seafood like shrimp or scallops. AND, if you want your crust to wow, wrap low fat string cheese sticks into the edges of your crust for cheese stuffed crust pizza. DEEEVINE y’all! Looking for Low Carb Options? Gluten Free? Change your crust! 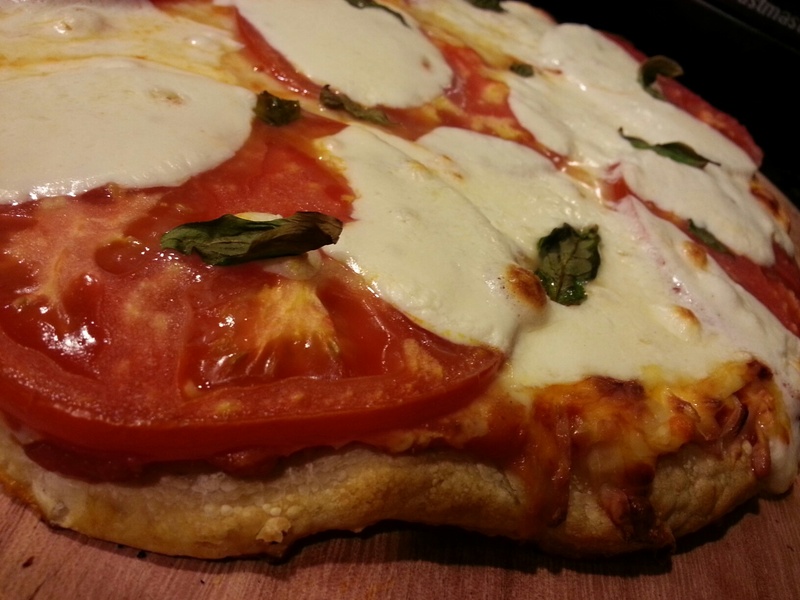 There are many recipes for pizza crust using cauliflower and also recipes using cream cheese! 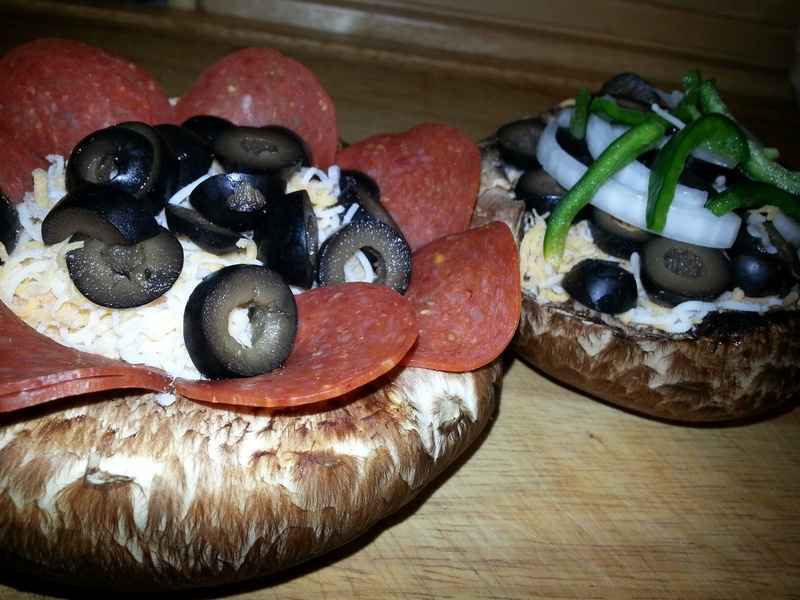 You can also use a portabella mushroom cap as shown above for GREAT personal pizza options. Try one of these to lighten your carb load! Vegetarian Options? Veggie pizzas are the bomb! Did I say margherita pizza was my absolute favorite? Pizza is the perfect vegetarian meal as anything goes here! From tofu, to fresh greens, eggplant and even a ratatouille version! Impeccable Thyming: In a time pinch for dinner but still want fresh and homemade? Make sure you’ve frozen, then thawed, some of that sauce and dough. You can even freeze a packet of sauce, WITH your dough! Stick it in your fridge to thaw before you leave in the morning and dinner can be ready in as little as 20 minutes. Keep a stockpile of fresh cut veggies in the fridge to speed your process even more and offer the little ones healthy after school snacks. Put together a nice salad and voila! Chef’s tip: No one wants the cleanup for messy floured cutting boards or rolling pins. 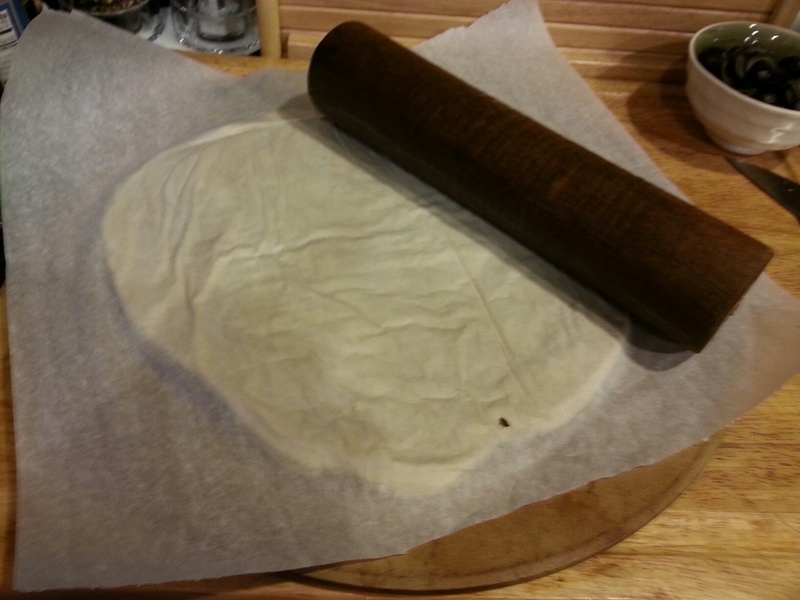 Once your crust is ready to be rolled, place between two slices of parchment paper and roll away! No need to flour your surface and your rolling pin goes right back in the cabinet. Again, I like easy y’all!